When choosing window film, the number of options available is overwhelming. At Rayno Window Film, we want you to know how to choose window tint that will meet your needs, yet we know how frustrating it can be to have so many choices available. Auto window tint provides a way to protect your car’s interior from sun damage, reduce glare while driving, and improve the overall look of your vehicle. Window tint can also reduce heat in the vehicle, which is beneficial to those who live in hot climates or who regularly park outside. Yet not all window tint products are created equal, and the best window tint products are sometimes hard to distinguish in a crowded marketplace. 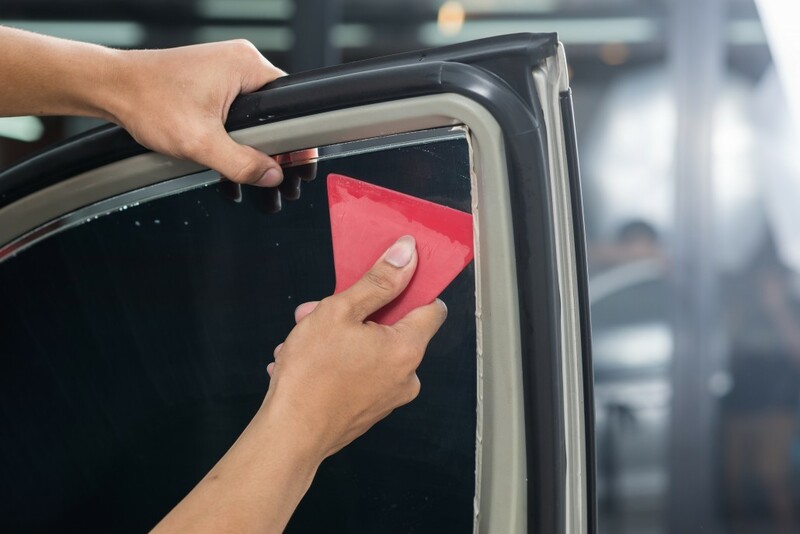 Here are some tips to help you choose the best car window tint and window film that will give you all of the benefits you want and the longevity you need. The first step in narrowing down your window tint choices is understanding the different types of window film on the market today. Window tinting for car windows falls in two basic categories: non-reflective film and metalized film. Non-reflective film provides both heat and glare control through solar absorption. One of the most common and traditional non-reflective films is dyed films and they provide increased optical quality and clarity through strong glare control. Dyed films are less effective in controlling solar heat absorption compared to metalized films that reflect the solar energy. Metalized films reflect the sun to keep it from damaging and heating the car’s interior and also help provide privacy. Though in some states, metallic, reflective tinting is not legal Non-reflective film provides shade in instances when reflective tinting is not allowed or in the case of vehicles with navigational equipment like boats or RVs — when the reflective coating may impact the function of the vehicle and interfere with cell phones, radar detectors or GPS. Car window tint can come in a number of colors, with black, charcoal, gray, gold and bronze being popular. In addition to these basic categories, the actual material used to tint car windows varies. The materials used to create window tint also vary from one product to the next. The three main materials are dyed film, carbon film, and ceramic film. Dyed film is the most cost-effective option, but has the highest chance of needing replacement. Carbon film is dense and strong and has a low discoloration rate, but can create problems with glare and haze. Ceramic film limits these problems and has a high heat rejection, but it tends to oxidize quickly and can fade. Rayno Window Film offers a fourth option; nano carbon ceramic, an innovative new hybrid of both carbon and ceramic, combines the benefits of both parent types while minimizing the drawbacks, making this a favorite choice among car owners who want longevity and good function. Shade — The shade is the color of the window tint. You will want a tint that is in line with state laws — as many states ban certain colors — and is aesthetically pleasing to your vehicle’s overall look. Color stability — How well will the color hold up over years of exposure to UV radiation? Look for window tint choices with long color stability. A color stability rating of less than 1 is excellent. Clarity — For your safety, you need window film for your car that offers clear visibility, reducing reflection and improving clarity during the day and at night. Solar control — If it’s too hot inside your car, solar control is critical. Excessive heat creates an atmosphere that’s uncomfortable and unsafe for your car’s interior. Which window tint is best? One that has good solar control, good clarity and good color stability — and comes in a shade that you like. UV rays pass through window glass and cause damage and fading to your car’s interior. When you are sitting in your car, it can also damage your skin. The best window tinting products are UV rejecting, and this can protect your skin and your car’s interior from 99 percent of the UV rays from the sun. Nano carbon ceramic tints, like those offered through Rayno Window Film, provide superior UV light protection to keep you and your car’s interior safe. When choosing window film, be certain to check the laws in your state. Each state has specific laws about color, reflectivity percentages, window tint percentages and other features of window tint that may or may not be allowed. Click here to check the laws in your state. Many states do not allow metallic, reflective tinting on vehicles. If you are going to have your windows tinted, working with a qualified installer is important to ensure that the job is done right. While you can get DIY kits for window tinting, you will find that professional tinting is more affordable than you might think, and can save you money in the long run. Depending on the windows you choose to tint and the type of tint purchased, expect to spend between $100 and $500+ for window tinting. The signs of bad installation appear rather quickly after installation, and the quality of the film itself plays a large factor in whether or not the film will last after its installation When installed quality proven films by a professional installer, the window tint should last for many years, so you will not have repeated costs until the tint begins to fade and needs to be replaced. As you are considering how to choose car tint, remember that the longevity and durability of the product is the most important feature. Rayno Window Film is one of the best choices on the market because our unique technology gives a longer-lasting, fade-protected product that will serve your car well for its expected lifetime. If you are interested in having the industry’s leading window tint installed on your vehicle by a qualified industry professional, contact one of our dealers for more information, or learn more about the benefits of our nano carbon ceramic technology. We have multiple dealerships across the country using Rayno Window Film products to provide you with the ultimate tinting options. Can Car Window Tint Block UV Rays? Which Film Offers UV Protection?